The complete recordings of Charles Tournemire from Saint Clotilde, Paris 1930-31. 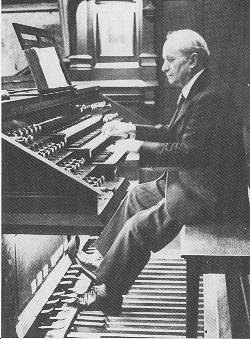 These recordings hardly need any introduction to organists. They consist of some works by Cesar Franck, two movements from his L’Orgue Mystique, and of course his legendary five improvisations which Maurice Duruflé transcribed and published in 1958. He was a student of Cesar Franck and was the organist of Saint Clotilde from 1898 succeding Gabriel Pierné until his death in 1939. Though his skills as an interpreter are well preserved here, his greatest ability was to improvise. Until the server space is up and running at the Royal Academy of Aarhus, I have chosen to store the files on Rapidshare.com. They should be quite easy to download and with reasonable speed also. These recordings have kindly been provided by Michael Gartz - a great thanks to him! Welcome to The International Historical Organ Recording Collection. Here you will find historic organ recordings transferred from 78rpms and early LPs. They are all recorded before 1959, which makes them public domain and therefore legally publishable. The transfers are privately made by the owners of the original sources, so these recordings are not digital copies from any commercial reissues. The commercial interest and profits in reissuing historic organ recordings are low, and therefore a lot of materials have never been transferred to a more up to date medium. Inspired by the work by Neal Kurz on his very interesting blogsite http://nealshistoricalcorner.blogspot.com/, and with help from Michael Gartz who holds a huge collection of historic recordings, the sound technician, record collector and historian Claus Byrith, and in collaboration with The Royal Academy of Music in Aarhus, Denmark, I will over time try to publish as many important historical organ recordings as possible.